At the first meeting in 2018, a day prior to a “bomb cyclone,” an unusual extreme weather event bringing record high tides, with flooding and hurricane force winds, Sustainable Belmont gathered to discuss our Climate Action Plan. 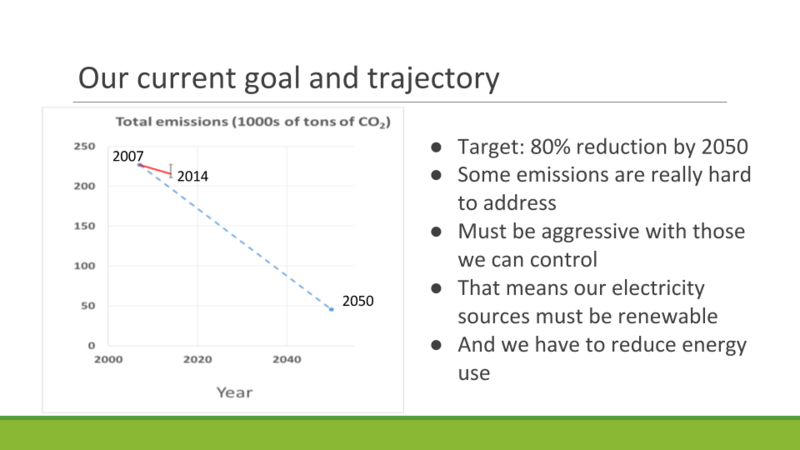 As the above slide shows, Belmont is lagging behind it’s trajectory for 2050. The problem is that the longer we put off reducing carbon emissions, the more challenging and expensive this task becomes. This is important for our kids future, since scientists point out that the atmospheric level of CO2 needs to drop to 350 ppm to keep the earth from warming–we’re heading for increasing global temps beyond 2 degrees celsius. We are currently over 400 ppm and continuing to accelerate emissions. CO2 takes hundreds of years to dissipate, so emissions accumulate–like a bathtub with many faucets and only one drain. Humans often ignore goals far into the future, but more immediate goals can serve to motivate changes. What interim goals make the most sense? For instance, Concord has committed to having 100% of their electricity provided from renewable sources by 2030. Belmont could commit to something similar and by hiring an energy manager as many towns have to manage the shift away from fossil fuels. Some in attendance drew attention to a shift that needs to happen in our thinking about energy: in addition to efficiency to consider fossil fuel free options. For instance, electric vehicles (EVs) use less than half of the fossil fuels needed per mile (given the source of electricity and transfer losses) than a traditional car. Air source heat pumps are another example of lower fossil fuel use over high efficiency oil or gas furnaces. With renewable energy and battery storage increasing capacity on the grid as expected over the next few years, these comparisons favor electric appliances even more. When weighing public policy options, Belmont’s town officials, from the Selectmen, Town Administration to Schools need to consider what impact different policies will have on the town’s climate action plan. In 2018, to ignore the town’s carbon footprint when deciding policy is negligence. Most citizens want the environment to be a consideration whether its building a new high school or adding more renewable energy to our electricity. As individuals, we can begin to think about how we can reduce our fossil fuel consumption, and not just energy efficiency. Consider EV’s and air source heat pumps rather than gas or oil fired appliances.